Adam Christensen was born in the UK but grew up in Denmark. 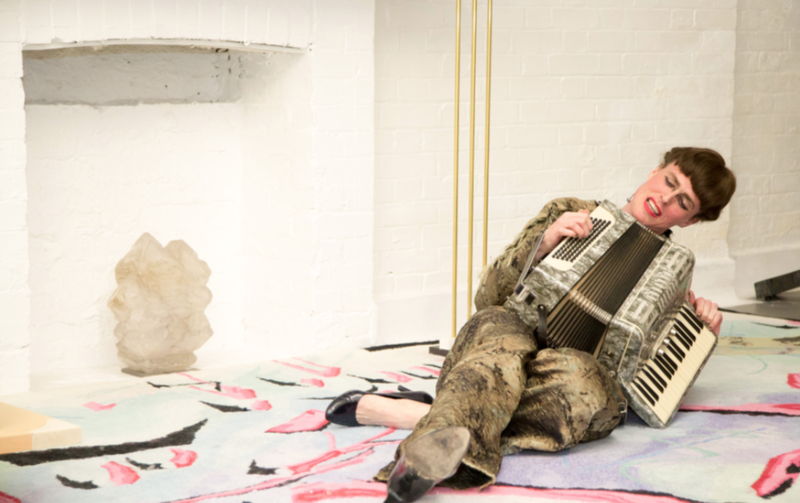 They are a London based artist making performance, video, fabric and text works. They have performed with the music project Ectopia, which was Wysing Arts Centre’s band-in-residence in 2016. They have previously performed and presented their work at DRAF, Southard Reid, Institution of Contemporary Arts and Hollybush Gardens London. During his performances Adam sings and plays accordion. Staging and costumes are important in his presentations and gives the audience a holistic experience during his storytelling. Fjöllistamaðurinn Adam Christensen fæddist í Bretlandi en ólst að mestu leyti upp í Danmörku. Hán býr í London og vinnur að gjörningum, vídjóum, textíl og textagerð. Adam hefur stigið á svið og sýnt verk í DRAF, Southard Reid, Institution of Contemporary Arts og Hollybush Gardens London. Meðal annarra verkefna hánnar er þátttaka í “Ectopia” sem gestur í Wysing Arts Centre árið 2016. Adam leikur á harmonikku og syngur í gjörningum sínum. Búningar og gervi vega djúpt í framsetningu hans á list sinni og endurspegla gervin oft frásagnir hans í ljóðunum sem hann syngur.